Are you looking for a wedding ceremony planner in Melbourne? You want a ceremony created just for you, but where do you start? I would love to get together with you and hear your ideas for your special day. With my experience as a Civil Marriage Celebrant, I can help with suggestions, and together we can plan your perfect Wedding Ceremony. There are virtually unlimited options to choose from for your wedding ceremony where we explore together. You may want to include family or friends, children or step children and references to your cultural heritage. 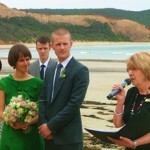 Ro Bailey is a Wedding ceremony planner in Melbourne. To ensure everything will run smoothly, your wedding ceremony planner can take my rehearsal before the event, preferably at your chosen area. A rehearsal means that everyone knows what to do and how to do it, so that all participants can be more relaxed on the wedding day. Read more about a special small wedding celebrant in Melbourne and finding a civil wedding ceremony planner in Melbourne.